This is a tiny little pot found at Chanctonbury Ring. It dates from shortly after the Roman invasion of Britain in 43 AD. A Roman temple or shrine has been discovered by archaeologists in the middle of an earlier, probably late Bronze Age, enclosure at Chanctonbury. Many finds came to light such as red and white mosaic floor tiles, roof tiles, the foundations of two buildings and evidence of religious offerings. 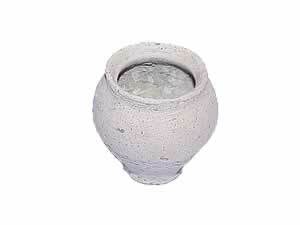 The little pot was found in a shallow depression. This suggests that it contained something special and was buried by someone with a wish or a prayer for help from the gods. See our article about Chanctonbury Ring HERE.